We love Macs here at bestroulette.net but it’s been tough for us in the past to play Mac Roulette. Most online casinos have historically catered to Windows users. Luckily, the increase in popularity of the Mac -combined with some exciting new technologies- has made it easier for us to get our Roulette fixes in on our favorite computers. 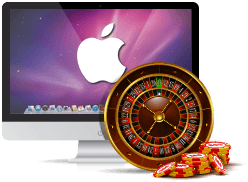 There are two key ways you can access online Roulette games through your Mac: native Mac clients and Mac-compatible games. 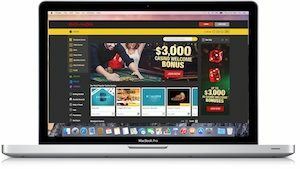 Some casinos now offer native Mac clients you can download directly. Just as you would do with any program. These casino downloads will have an integrated cashier. The main benefit of installing casino software is that the key graphics and game software is held locally. Your machine does a lot of the work, less information is transmitted over the network, and the games are smoother and faster as a result. The more common method nowadays is to offer Mac-compatible games through your browser. The technology behind these games has improved massively in recent years. Games have become stable and easy to use. Most Mac Roulette games will automatically adapt to your screen size and touchscreen controls. Casinos which use Flash can create accessibility issues for Mac users. Recent models are not Flash-compatible as a default. There are easy solutions for this, including emulator software and 3rd party plug-ins for your browser. Many casinos instead use a mix of Java and HTML5 to render their non-download casino games – avoiding these issues altogether. Bovada.lv is part of the global Bodog brand and has different options for different Mac devices. If you are running a Mac computer (or MacBook) then you can download the client and enjoy the RTG and BetSoft titles that way. If you are running an iPad then you can access Bovada’s mobile casino instead – where you will find a specially adapted European Roulette game as well as a selection of cutting-edge 3D slots. When it comes to compatibility, you cannot beat the casino from online gambling giant 888 casino. This has been adapted to all Mac devices, including a Download, instant-play games (using Java and HTML5) and app versions. What is more, 888 gives you $88 upfront –no deposit needed– to check out their real money games. You’ll be faced with a huge choice of different games at Mac casinos nowadays. Some casinos have more than 15 variations of Roulette to choose from. The first rule of thumb when narrowing down these choices is to discount the American Roulette games. These have the extra zero on the wheel which significantly increases the house edge. Of the standard tables, the French Roulette games are the best – these return 50% of your stake for outside bets when the ball lands on the (single) zero. Live Dealer Roulette games stream a live casino and let you bet on the outcome. These games are enjoying a boom at the moment, and many software houses have a separate app that allows you to enjoy Mac roulette on your iPad. Mac computer users will be able to access them through the in-browser versions. Finally, Roulette has spawned many quirky variations including Multi-Wheel games, Pinball Roulette, games with progressive jackpots and even one with a 13 slot wheel called ‘mini Roulette’. Best US Online Casino for Mac – Bovada features 4 roulette games, including American and European Roulette. Download the games to your MacBook or play in the mobile casino from your iPad. Bonus: Join and receive up to $3,000 casino Welcome Bonus and get three 100% match bonuses. Best International Casino for Mac– Global players will enjoy playing online roulette at 888casino. Roulette games available for all Mac devices – Downloads, Instant Play, and apps. Bonus: Join and play with up to £888 no deposit needed + up to £1500 Welcome Bonus Package.